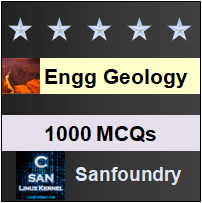 This set of Engineering Geology Multiple Choice Questions & Answers (MCQs) focuses on “Kinds of Metamorphism”. Explanation: Thermal metamorphism is a general term including a variety of metamorphic processes in which the heat factor has played an important role. 2. Which type of metamorphism is common in rocks close to magmatic intrusions? Explanation: Contact metamorphism is a common type of thermal observed in rocks existing close to the magmatic intrusions, injections and lava flows. Explanation: Pyrometamorphism is a type of thermal metamorphism in which case a part of country rock may actually get entrapped within a magmatic body. The effects result due to intense localized heating. Explanation: Plutonic metamorphism is a process of metamorphism that takes place due to equally important role of imposed loads and very high temperatures that become natural at those great depths. 5. Which kind of metamorphism is also called dislocation metamorphism? Explanation: Dynamic metamorphism is also called clastic metamorphism, mechanical metamorphism or dislocation metamorphism and is brought about by conditions in which pressure factor plays a dominant role. 6. In which metamorphism there is almost no or little new mineral is formed? Explanation: In the dynamic metamorphism, there is no or very little formation of new minerals. These are the original textures and structures of the rocks that are partially or totally obliterated. Explanation: Thermodynamic is also referred as regional metamorphism and may be considered as the most important as well as prevalent type of metamorphic processes. Explanation: Thermodynamic metamorphism involves development of large-scale changes in the structural and chemical constitution of the pre-existing rocks under the combined action of pressure, temperature and fluids. Explanation: Sometimes the pressure is of the type of hydrostatic type such as load of the overlying rocks. The process is then called load metamorphism. Explanation: In all types of thermal metamorphism the change is generally in the direction of mineralogical reconstitution. These processes may induce changes varying from simple baking effect to complete or nearly complete recrystallization of almost all original minerals. Explanation: Metasomatism may be broadly defined as a metamorphic process involving essentially formation of new minerals by the mechanism of chemical replacement of pre-existing minerals under the influence of chemically active fluids. 12. Metasomatism occurs at which level and state? Explanation: The metasomatism replacement of minerals takes place at atomic level and in solid state. The chemically active fluids may be provided by various ways. Explanation: Pneumatolytic is the process of metasomatism where the fluids are in the form of gases or vapours. 14. The total volume of the rock is changed after metasomatism. State true or false. Explanation: A common fact observed in the case of metasomatism is that the total volume of the rock remains by and large unchanged after the process is completed.